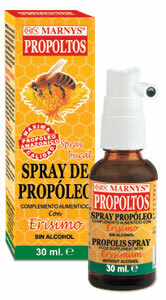 PROPOLTOS is a new and practical alcohol-free mouth spray , specially formulated to care for your throat; made up of propolis concentrate and erysimum (also known as wallflower) in order to set up a protection barrier against possible infections,while soothing throat and giving a nice flavour thanks to its mint content. It is specially indicated for sensitive throats. Point cannula at the desired area and press spray twice. Repeat this 4 to 5 times a day. Shake before use. Deionized water, vegetal glycerin, erysimum (Sisymbrium officinale), propolis concentrate, soya lecithin, saccharose ester, flavour, potassium sorbate, Mentha piperita essential oil.